This recipe stems from my admiration of local chef and cookbook author, Julee Rosso. Julee mastered the steamed artichoke, and this is my weeknight, kid-friendly version of that lovely French dish. I often steam one artichoke while I make dinner and tell the kids it’s there to eat before dinner everytime they remind me they are hungry (which is OFTEN!). I love when my kids surprise me and eat something I deem interesting or FANCY. There is something lovely about kids pulling artichoke leaves out of the heart and scraping the goodness out with their teeth. It seems harder to do than shovel string cheese into their mouth and also feels a bit European. Why do I assume artichokes are better than white, waxy, cheese? 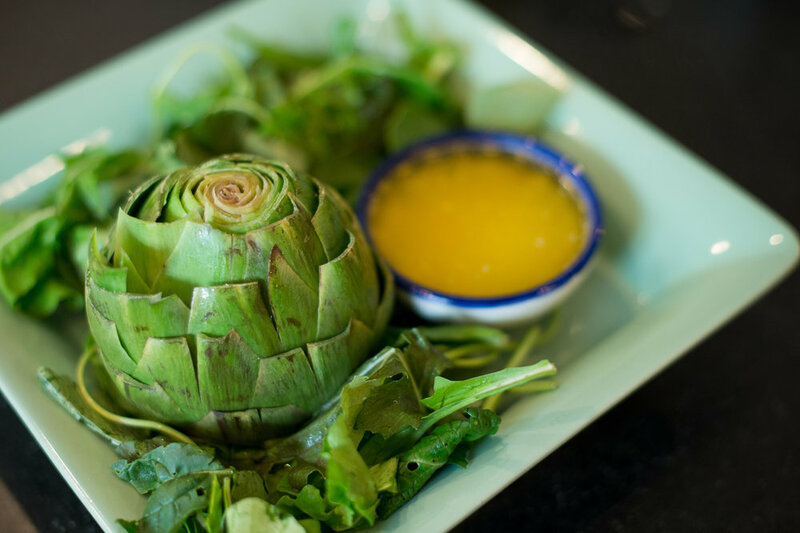 This seems to be just my personal taste, but artichokes are truly more healthy and satisfying for my kids’ energetic needs. Enjoy this recipe and all the fun of eating petals! Wash artichoke and trim off all the sharp points with scissors. Cut off stem with a knife and then cut off the top sharp point of artichoke as well. Lay the artichoke in the middle of a 1-foot long piece of Plastic Wrap and squeeze a lemon over it. Tightly wrap the plastic around the artichoke and place it in microwave. Cook for 5 minutes. Meanwhile, combine olive oil with chili flakes in a cute bowl for dipping. 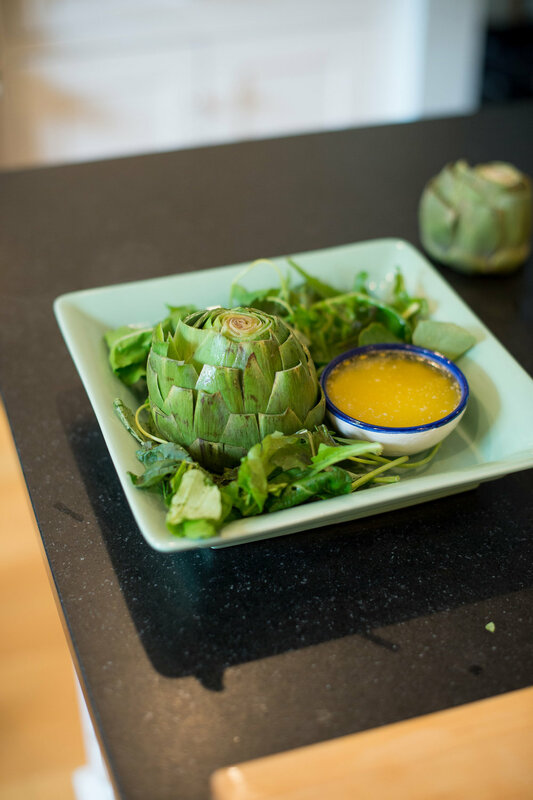 After cooking, unwrap the artichoke and place it stem side down on a plate. To eat, pull the petals off and dip in oil. Don’t eat the whole petal! Scrape off the fleshy parts with your teeth and -- YUM! -- enjoy. Put out an extra plate for used petals.